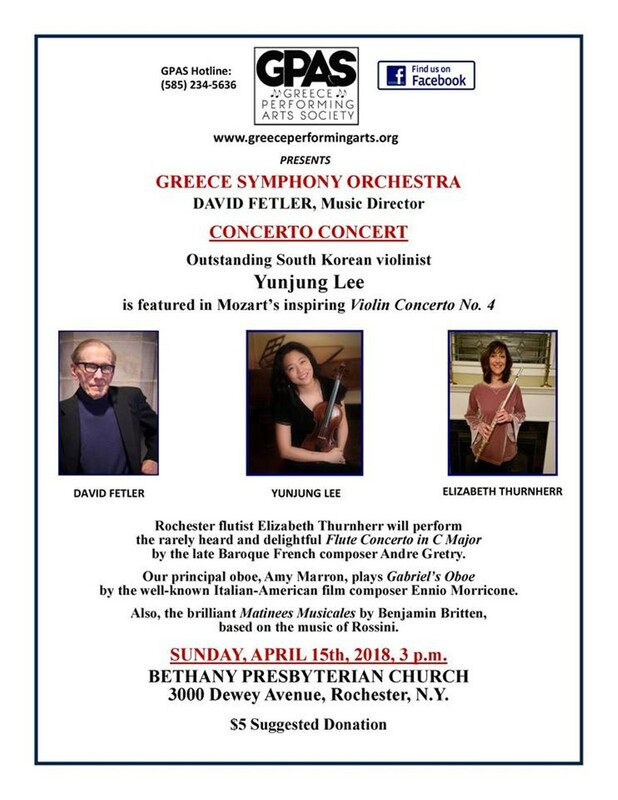 The Greece Performing Arts Society (GPAS) presents a Concerto Concert by the Greece Symphony Orchestra under the direction of David Fetler. Violinist Yunjung Lee, Eastman School of Music DMA student from South Korea, will be the soloist featured in the inspiring Violin Concerto No. 4 by Mozart. Rochester flutist Elizabeth Thurnherr will be featured in the rarely heard late Baroque Flute Concerto in C Major by the French composer Andre Gretry. 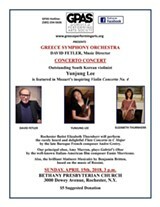 The Greece Symphony's principal oboe, Amy Marron, will perform Gabriel's Oboe by the well-known Italian-American film composer Ennio Morricone.